Come VolunCHEER with us at this year’s Deep RiverRock Belfast City Marathon! Volunteering your time to help Action Mental Health raise funds is not only good for us – it is also good for you, as well as your community. The reasons for volunteering for a good cause are manifold. Volunteering provides vital help to people and groups in need right across your community. 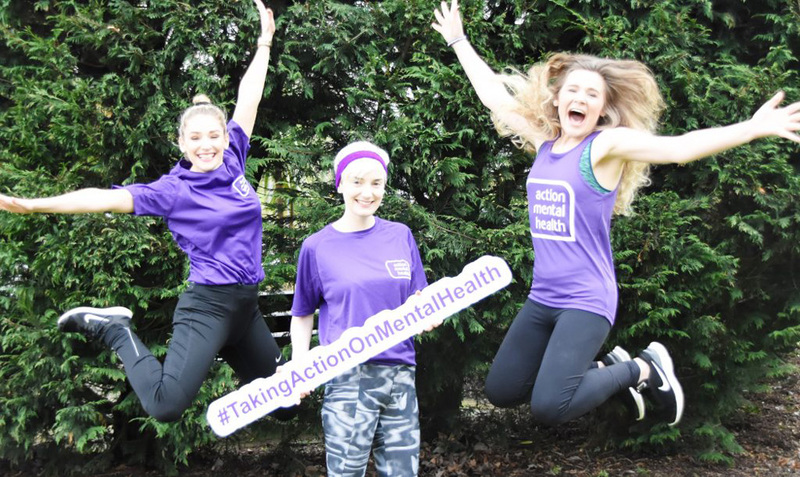 Not only will your time, offered freely, help raise funds for charities, like us at Action Mental Health, it can actually improve your own mental health and well-being. Studies have shown that volunteering is beneficial at combating stress, depression and anxiety and also serves to keep you mentally stimulated, improve your self-confidence and provide you with a sense of purpose. It doesn’t matter whether you volunteer for a single event, or whether you want to make a more long-term commitment and volunteer on a regular basis, you’ll be a valued member of team AMH – and it will be worth it. Any time you can give on a volunteer basis can make a meaningful difference to people with mental health needs throughout Northern Ireland. You will meet like-minded people who are passionate about making a positive difference to people’s mental health and well-being. It’s an excellent opportunity to boost your career prospects by enhancing your CV or UCAS application and help you stand out from the crowd. It will help teach your children about the impact of giving back to the community. Children watch everything you do, so, by following your example, it will give them first-hand experience of the benefits of volunteering, both to those on the receiving end, and to themselves. You’ll have lots of fun! We have plenty of fun opportunities such as volun-cheering to support our runners at the Belfast City Marathon. You’ll meet new people and make new friends! Volunteering is a great way to meet new people, especially if you are new to an area. It will provide you with an opportunity to gain valuable new skills, knowledge and experience – such as communication, problem solving and teamwork. Volunteering is a great opportunity to give back to a charity that you believe in or that has impacted you either directly or indirectly. It will help boost your confidence and self-esteem, by gaining personally from new experiences and meeting new people. It will also help you log volunteering hours for Gold Duke of Edinburgh – for those over 18. Even if you have limited mobility there are still ways you can help us here at Action Mental Health. You can volunteer to man one of our cheer stations at the upcoming Deep River Rock Belfast City Marathon, on Sunday, May 5; host your own Great Big Purple Picnic, an annual event which takes place in spring; or devise your own fundraising effort to suit your personal requirements. Join us cheering on our fantastic runners and cyclists across Northern Ireland, promoting AMH at glamorous wedding fairs or join the team on collection days. You will be notified of our exciting volunteering opportunities and then it’s up to you to pick and choose which events you would like to participate in. No experience is necessary to volunteer for Action Mental Health, however, you must be at least 18 years of age unless accompanied by a parent or guardian. What Volunteering Means to Us? By volunteering with us you’ll be helping to raise money and awareness to help change the lives of those living with mental ill-health and promoting resilience and well-being to future generations.